If you are looking for a delicious, elegant, gorgeous, and easy side dish/appetizer you can prepare before a party or meal . . . you have found it! The first time I made these was for my son’s graduation party. 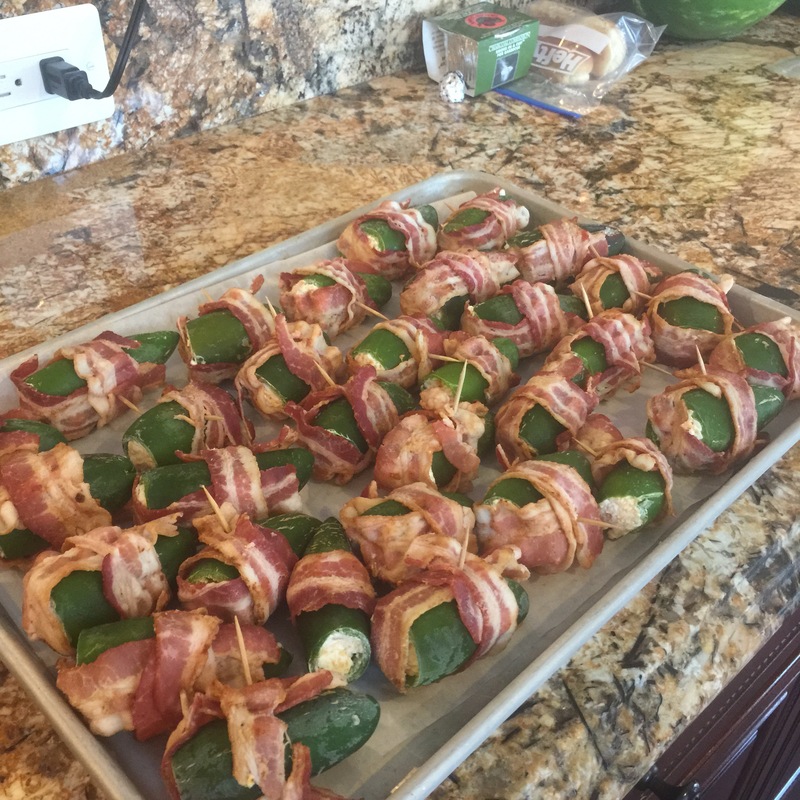 It was a “taco theme” and these poppers fit right in. My husband actually stood over the plate and while munching away insisted to everyone how they should really try the queso dip instead. Fortunately, no one believed him and I got the “validation” that this was really enjoyed by all. Even my younger children that tend to steer clear of anything spicy loved them. I did wonder if my queso needed tweaking though… lol! Anyway, I am really excited to share the recipe and hear if you like it as much as we did. One of the beauties of this recipe is how flexible it is. You can make a small handful for dinner or snack ; or, if you have more time or jalapeno’s you can make a hundred to freeze and pull out as needed. My biggest batch was 100 and it took several hours to finish. It was pretty satisfying though to open my freezer and see all those bags of individual servings ready at a moment’s notice. If I only have a small amount of time or if my garden is being miserly in production I can still use this recipe to accommodate. It works for anyone and any situation. Except, of course—if you hate jalapenos. This recipe is proportionally written for 14 large jalapeno peppers. The first time I made this my jalapenos grew about bite size which was “small” and I had a bunch of filling left over. The next time I had large peppers—more like two or three bites—and the filling worked almost exactly correct. I suggest erring on the side of making too much filling—it can always be repurposed and realizing half way through you need to run to the store for more ingredients is a fast track to frustration. Totally ruins the “joy” of making something special. 14 large jalapenos—remove the membrane and seeds. This is the part that really gives peppers the “heat.” If you love spicy feel free to leave some behind but be prepared…have the milk handy. Since I have children that get quite cranky with too much heat I also rinse the peppers after this step. Be warned though—the rinsing activates fumes that can make you cough and tear up a bit. If really sensitive you may want to put on a mask or just skip this step. I just do it while hacking and hope no one sees the mess I am at that moment. 1 8 oz. cream cheese— pull this out before starting the de seeding step so it comes to room temperature. ¾ cup finely shredded sharp cheddar cheese. 2 slices partially cooked bacon if large peppers, one if small, basically you want a taste of bacon in each bite. Mix all the cheeses and onion together and put aside. Pre cook the bacon. This step is really important. You want to cook the bacon about half way. This allows for enough “flexibility” to allow easy wrapping around the pepper; but, also allows you to freeze the peppers, cook, and have a beautiful, crisp slice of bacon surrounding the cheesy pepper inside. Look for some brown in the bacon but a good amount of pink still remaining. It’s not a perfect science so don’t worry too much. Just cook the bacon about ¼ to ½ of the time of what you would normally serve. Put on a parchment lined cookie sheet and place in freezer preferably overnight but at least long enough to freeze pretty firm—at least 4 hours. DO NOT BAKE WITHOUT FREEZING. The freezing helps allow enough time to cook the bacon without leaving the pepper soggy. You can bake immediately after freezing if preparing for a quick serving or you can leave frozen until needed . . . but, don’t skip the freezing. If after freezing you are ready to bake. . skip to step 9. Remove from freezer. If you are preparing for a later baking date I suggest you take the frozen poppers and combine them into appropriate serving sizes. For our family. .which is 2 adults and 4 children at home. . . I use a combination of 6 packs and 3 packs when peppers are large. I can always pull more packages from the freezer and I hate to lose good food because I had too much and it went to waste. If it is an appetizer I pull fewer, a side dish more. I LOVE using the food saver for this purpose. I can make a freezer safe bag, place however many I want inside, and vacuum out all the air creating a perfect airtight seal in about 30 seconds. Place paper towels around the poppers and lay them toothpick to toothpick on the side. This helps prevent the toothpicks from tearing the bags. These are then placed in the freezer until needed for baking. 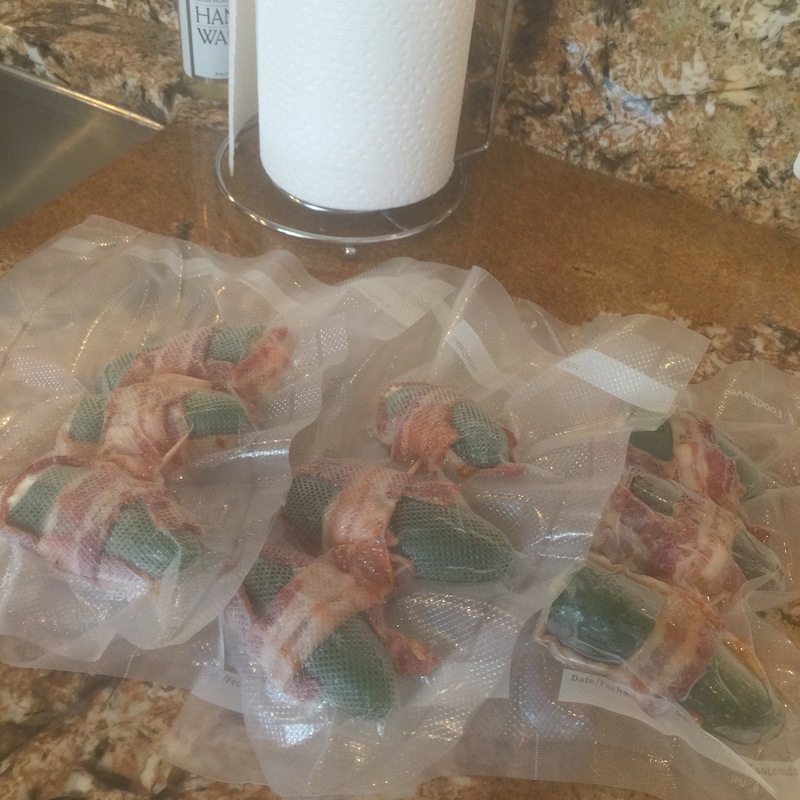 When ready to eat simply remove from the freezer and place frozen poppers in a preheated 450 degree oven. I suggest using parchment because the cheese will very possibly leak a bit. Bake for 10-20 minutes (depending on the size of the pepper) until bacon is crisp. If the cheese leaks it isn’t a problem. Just spoon it back in while no one is looking. Serve and enjoy! Melody, I am so happy that you have enjoyed the articles! I look forward to your return; and, hearing your thoughts on all the new posts to come. Thank you!!! !